Entrepreneur Ginny Mallard is a dog person. Bartender Teddy Tonica a cat person. But when these two and their respective canine and feline team up in L.A. Kornetsky’s Collared to solve a mystery, they discover that twelve legs (and two tails) are better than four! Appearing "with" Laura Anne Gilman. Readers of Laura Anne’s fantastic fiction will want to check their shelves to be up to date with works from the world of the Cosa Nostradamus, where magic is alive and well in the modern age, including the Retrievers and Paranormal Scene Investigations series. L. A. Kornetsky signs Collared . Laura Anne Gilman's book Beyond Grimm: Tales Newly Twisted was available from LibraryThing Early Reviewers. Laura Anne Gilman's book Brewing Fine Fiction was available from LibraryThing Early Reviewers. 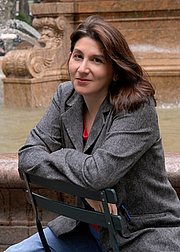 Laura Anne Gilman is currently considered a "single author." If one or more works are by a distinct, homonymous authors, go ahead and split the author. Laura Anne Gilman is composed of 11 names. You can examine and separate out names.